Yesterday, Barack and Michelle Obama unveiled their astonishing presidential portraits to universal acclaim. 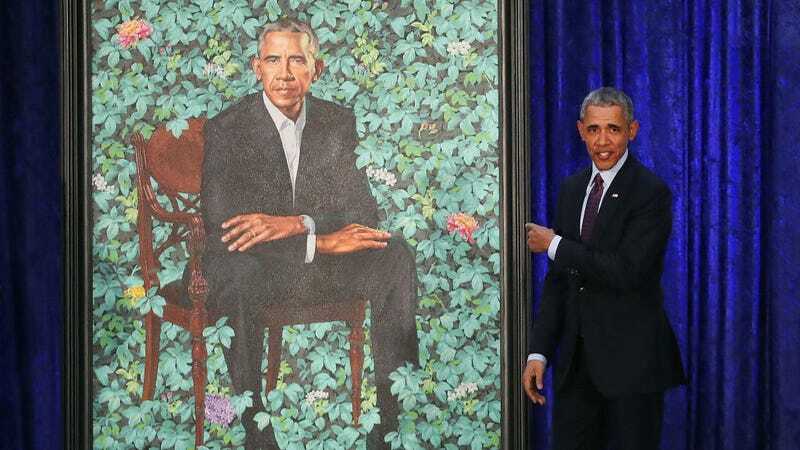 Artist Kehinde Wiley portrays the former president as concerned, probing, and calm, with just the faintest hint of a smirk playing across his lips; he is settled within a radiant, repeating wall of foliage, faintly obscured where his shoes nestle into the overgrowth. As presidential portraits go, it’s bold, opinionated, and utterly modern. Alongside Amy Sherald’s painting of Michelle Obama, it also happens to be the first commission to a black artist from the National Portrait Gallery. Controversy surrounding Kehinde Wiley’s wildly non-traditional portrait of the Commander-in-Chief broke out within minutes of its unveiling; with industry insiders claiming the artist secretly inserted his trademark technique -concealing images of sperm within his paintings. If you’re hoping for more explanation than that, you will not find it in the article, which is still available to read via cache. It moves on from there to note that the artist once sardonically used the phrase “kill whitey” in a New York magazine profile, which at least has the virtue of being true, unlike the claim that he put sperm in his painting of Barack Obama, which is objectively not true. Let’s take a closer look, just to be sure. Yep, definitely just a person’s face. You’d think Sean Hannity would be the expert on aggressive sexual deviancy, given that he spent most of his career working for disgraced sexual predator Roger Ailes and alongside disgraced (alleged) sexual predator Bill O’Reilly. Unfortunately, this is what happens when you take news tips from 4chan. That would explain why Hannity pulled the article, as well as the tweet endorsing said article almost immediately after issuing it. Presumably, SeanHannity.com regrets the error, and “Hannity Staff” will be reprimanded accordingly. Who is Form Submission 1649, and why do they hate Sean Hannity&apos;s Twitter account?